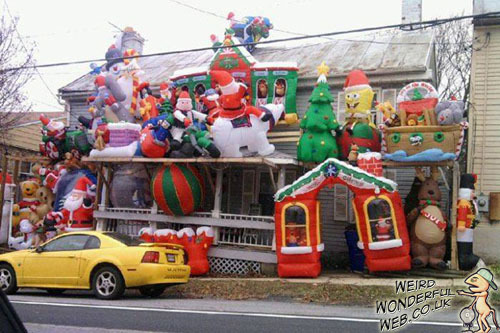 Weird Wonderful Web: Inflatable Xmas house of hell! Okay, maybe "Inflatable Xmas House of Hell" is a bit of a harsh title. But come on ... look at it! Lots of lights can make even the most dreary house look magical at Christmas. But I'm not sure what these "decorations" are doing, but enhancing the house they are not. Perhaps Christmas lights are too costly to run in the economic climate as opposed to this alternative way of decorating your house. It may just be, that the way to beat inflation is to use 'inflation'. Haha, get it? See what I did there? Oh never mind.